Morning has finally arrived and you are rushing to get out the door. No time to make and pack a lunch. No time to make a cup of coffee because you are trying to beat that morning traffic heading to work. Once you make it to your destination you have just enough time to pull into your favorite coffee house and buy that morning latte, but wait! Have you ever thought about how much that cup of coffee is costing you? You swipe your card and sip that hot creamy delicious coffee that was brewed just for you that you only paid $4 for. Not bad for a pick-me-up that will help you stay awake. Well, guess what? That cup of coffee that you so desperately have to buy every morning adds up. So let’s do the math. You had to work 5 days each week. That is 20 times a month if you are only getting coffee once a day. That means each month you are spending $80 on coffee. In one year you would have spent $960. Wouldn’t it just make more sense if you took some time each morning when you are getting ready for work to make a cup of coffee to go? Think about all the money you would save if you brewed that cup of coffee yourself. There are many coffee makers on the market that you can purchase that are programmable so you can set the timer to make the coffee while you are getting ready to head out the door and grab the coffee and go. Here are some recommendations for coffee makers if you are trying to save money this year. 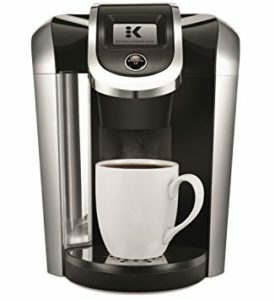 The Keurig K475 Single-Serve Coffee Maker is programmable and you can set the timer for when you want to have your coffee brewed and set the timer to automatically turn off the coffee maker before you leave your home heading to work. Just make sure that you place your mug in the coffee maker before it automatically turns on. Otherwise, coffee is going to go everywhere and you probably will not have time to clean up that mess. Click on the link to see more details about purchasing the product through Amazon. 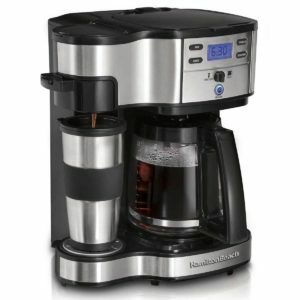 I would also recommend the Hamilton Beach 49980A Single-Serve, Pot Coffee Brewer. This 2-way coffee maker can make a pot of coffee in case you have a family of coffee drinkers getting ready in the morning or guessed over. This coffee maker comes highly recommended and you can’t bet the price of $52. Click on the link below the picture for more details and to purchase this coffee maker. One of my favorite finance authors and experts is David Bach. He coined The Latte Factor®. 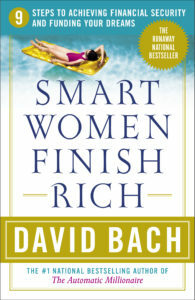 The term was first introduced in his book Finish Rich. So what does it mean? Simply that we take a look at our spending habits over time. What are we spending each and every day that can add up to a much larger amount? He used a latte as an example of something that many of us purchase every day. However, it is not limited to just coffee. Our spending habits can be affected by a lot of factors. That pack of cigarettes that you buy, that newspaper that bought at your local newsstand, eating out rather than packing a lunch are all subconscious spending habits. So you have to make the conscious decision to take control of your spending and make the necessary adjustments. Now don’t get it twisted! No one is telling you to no longer indulge. Just don’t do it every day. After all, you worked hard for that money that you made so you can choose how you want to spend it. But, ask yourself these question…Am I putting money away for a rainy day? Do I have enough saved in case I lose my job? Am I saving for my retirement? If you answered no to any of these questions then maybe you need to have a little more discipline in how you spend money. So if you don’t already know what you are spending each month then take a look at your bank and credit card statements. Do you see a pattern? So what is your Latte Factor®? Again, you don’t have to give up on everything that you enjoy spending your money on, but this is the only time when giving up on something means winning big in the long run. 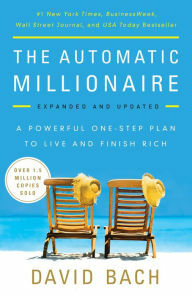 If you would like to read any of David Bach’s amazing money management books here are my favorite. Remember that wealth is not about how much you make. It is about how much money you keep and save.